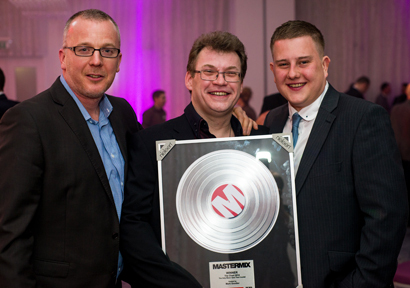 Despite the wealth of information available to delegates, the variety of prizes offered out by the speakers, and the coffee and cakes between each seminar, the thing the DJs attending the Pro Mobile Conference 2014 really had their eyes on was the Mastermix Quiz first-place prize; a plaque, adorned with a platinum disc, recognising extensive pop music knowledge. The first day of this year’s Pro Mobile Conference ended with the annual DJ Gala Dinner and this year’s entertainment took the form of a unique live pop quiz. Following a lavish three-course meal and Andy Tain’s acceptance of the Pro Mobile Lifetime Achievement Award, radio legend Mark Goodier took to the vibrantly-lit stage to host ‘The Chart – the only music quiz that counts’. Slightly different to your average pop quiz, players were each given their own buzzer with which to answer challenging multiple-choice questions on a variety of musical styles and eras. It was every man for himself and competition was fierce, with Mark revealing who was in the top twenty after every couple of rounds… and who was answering slowest! After ten heated rounds, with the number one position changing hands on more than one occasion, the winner was finally announced. With an outstanding score, displaying a wealth of musical knowledge, DJ Dave Mills took the number one spot to become quiz king of the mobile DJ world.